Roll over photos to read captions and click on photos to see bigger versions. Jenny O’Connor of the Greens at home – for No Fibs interview. Sophie Mirabella (Lib), Robert Danieli (KAP senate hopeful), Robyn Walsh (ALP) and Jennifer Podesta (Ind) at candidates forum in Mansfield. Pro Alpine cattle grazing activist asks a question at the Mansfield forum. Cathy McGowan campaigning at Benalla train station. Voters attend a Wodonga candidates forum in massive numbers. Jenny O’Connor (G) and Phil Rouke (KAP) waiting for Wodonga forum to begin. Independent candidate Jennifer Podesta makes a point – Wodonga forum. Sophie Mirabella addressing voters at Wodonga forum. Will Hayes – the bullet train guy at Wondonga forum. Jenny O’Connor addressing voters at the VFF candidates forum in Wangaratta. Uncle Wally (left) listening to response to a question from his friend (right). Palmer United poster and canola near St James. 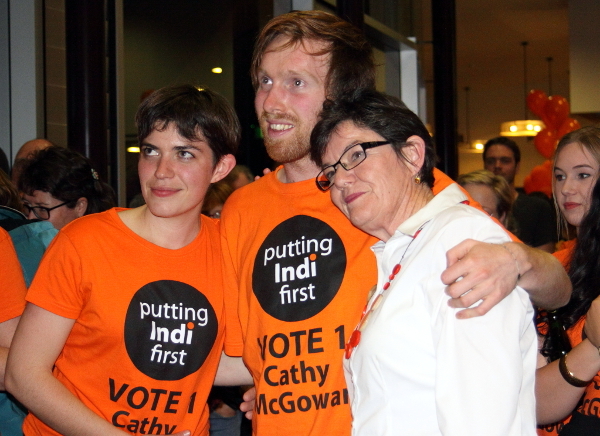 Jenny Anderson drove around Indi with a couple of friends, lending support to Cathy McGowan’s campaign. Liberals take all available poster space at Wangaratta high school gates the night before the election, only to find they have monopolised the wrong gate. Wangaratta Tafe booth after Greg and Sophie Mirabella removed their signs which were wrapped around the building. A sea of Liberal party signs at Wangaratta Tafe. 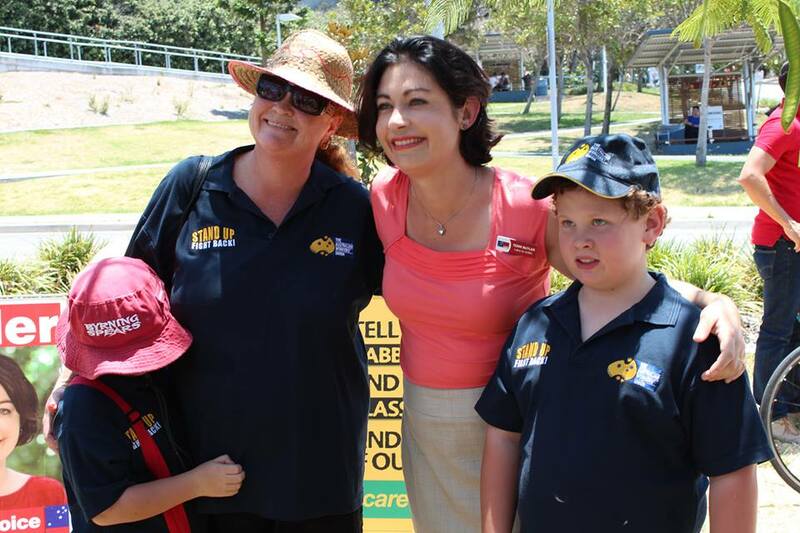 McGowan voluteers standing with Liberal anti-independent posters. Robyn Walsh with volunteers at Wangaratta. Cathy McGowan visits the Wangaratta Tafe booth on election day. Jennifer Podesta handing out how to vote cards. Sophie Mirabella handing out how to vote cards at Wangaratta. Ken Jasper showing his support for Cathy McGowan at the Wangaratta campaign office late on election day. Cathy McGowan’s tally room Wangaratta. Cathy McGowan hugs a supporter as she arrives at the Wangaratta Performing Arts Centre party on election night. A jubilant McGowan making her way to the stage to address supporters – election night party Wangaratta. McGowan stops for photos with supporters before her speech – Wangaratta. Win or loose, McGowan claims a victory with the locals of Indi for what they have achieved together. McGowan media advisor/manager Cambell Klose (centred) listens to speeches at the Wangaratta party. McGowan supporters during McGowans speech at the Wangaratta Performing Arts Centre. McGowan making her way through the crownd after her speech. Partying on election night in Wangaratta. Cathy McGowan’s young and enthusiastic young team after the speeches. Uncle Wally gives a welcome to country for Cathy McGowan’s victory party. A crowd of between 600 to 700 people attended Oxley Hall to celebrate Cathy McGowan’s election win. One of the members of the Voice for Indi Choir. Retired Nationals state MP Ken Jasper listening to the speeches. Cathy McGowan’s campaign manager Phil Haines addresses the crowd. Some of the nearly 700 strong crowd. Cathy McGowan and Phil Haines embrace after Paul leaves the stage. One of Cathy McGowan’s campaign team. McGowan raises her arms in celebration with the crowd. Some of the crowd listening to Cathy McGowan speak. Cathy McGowan listening to speeches. Performer singing up a storm during the speeches. Cathy McGowan listening to the scrutineers. McGowan’s scrutineers talking to the crowd about their experience. One of Cathy McGowan’s hundreds of volunteers talks to the crowd about his first ever engagement in politics. Cathy McGowan joins Sal Kimber and the Voice for Indi choir on stage. Sal Kimber and the Voice for Indi along with kathy McGowan sing their version of the Kelly and Carmody song From Little Things Big Thing Grow. Cathy McGowan and Sal Kimber share a moment of joy on stage. Sal Kimber (not shown) made the calls for the traditional country dancing. Young and old join in traditional country dance. As long as the band kept playing, people kept dancing. Because of the stunning success of McGowan, at some stage can a piece be written about the planning, organisation and methods that were implemented in the electorate.